So I found myself wandering throughout a local whisky shop in the bustling metropolis of Spokane. 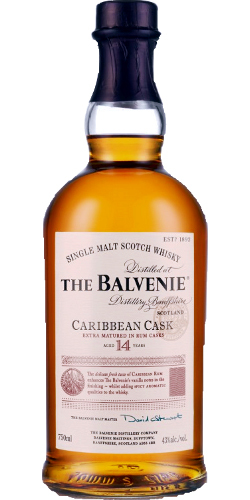 I found a curious bottle of Balvenie 14yr Caribbean Cask staring back at me. Four seconds later, it was purchased and in my possession. I was intrigued for simple reasons: it was a new Balvenie (strong, dependable bet) and it was finished in rum casks. Finishing fine malts with wine barrels is hip these days, though it doesn’t always work. I had a feeling this finish was really going to work. I’m always right 10% of time. This is a new permanent addition to the US line for Balvenie. After 14 years of “traditional” aging in oak, a few months in rum casks adds a new type of flavor to an already honeyed malt. Very curious, we were. Nose– Malty and clean. Caramel touch with apple and pear. Rummy underneath (most obvious tasting note ever). Taste– Sweet, delicious, thick mouthfeel. Full and seductive. Finish– Lovely, light peat, medium length. An oaky touch. Well rounded. Comment– Wonderful. Rum supports the Balvenie quality very well. Great stuff, lovely. Interesting and exciting. Becoming a favorite go to. At $109/bottle I must keep it to a glass or 2 a week. Take it slow, Peter. Or take it fast and make sure to comment here a few hours in.